Halifax’s top four destiny remains in their hands, despite a horrendous 58-18 loss to Championship leaders Leigh at the LSV. Richard Marshall’s side, unbeaten in seven matches, were their own worst enemies as they made nine errors - including five in their own half - during a terrible opening half. Leigh responded with some blistering attack, running up a matchwinning 34-6 interval lead and leaving Halifax needing to win both their final home games, against Featherstone and London, to be sure of clinching a place in the Super 8s Qualifiers. The visitors started badly, Gareth Moore’s third-minute kick being charged down by the outstanding Cory Paterson and the Australian back rower scoring from close range in the next set. Martyn Ridyard converted and while Leigh continued to threaten, the next score came from the visitors, full back Ben Johnston turning Leigh inside out on his way to the line and Steve Tyrer kicking the conversion to level at 6-6. That was as good as it got though as the visitors’ error count spiralled skyward against the best attacking team in the competition. Centre Leigh Smith and winger Adam Higson scored the next two, Paterson again instrumental, before Greg Worthington crashed over on the opposite side of the field, Ridyard’s conversions opening up a 22-6 lead that already looked more than decisive. 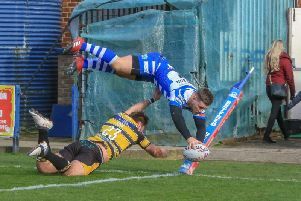 The league leaders continued to prosper, moving the ball with pace and purpose as Halifax struggled to stem the tide, Smith and Andrew Dixon both touching down before the break and Ridyard converting for a 34-6 half time scoreline. A largely academic second half began as the first finished, Paterson ploughing over near the flag and Ridyard’s conversion taking Leigh 40-6 ahead. Halifax salvaged some pride with back to back tries from Johnston and winger Will Sharp, both converted by Tyrer, to cut the deficit to 40-18. Normal service was resumed when Dixon scored his second, Ridyard goaling from touch, before Fuifui Moimoi and Kay touched down late in the day, Ridyard converting both.